Clutching a purple-colored pad close to his chest, Mike Hopkins looked like a modern-day basketball gladiator as he directed a layup drill at a recent practice. It’s been nearly seven months since Hopkins, the former Syracuse assistant, took over and the Huskies are discovering their new coach is a hands-on, caffeine-fueled basketball junkie who spouts motivational sayings like Bill Walton and is quite possibly the fittest 48-year-old on the planet. Junior wing Matisse Thybulle said: “He’s crazy, but in a good way. He really cares about us as people before players, which I really appreciate and the guys really appreciate. You want proof? 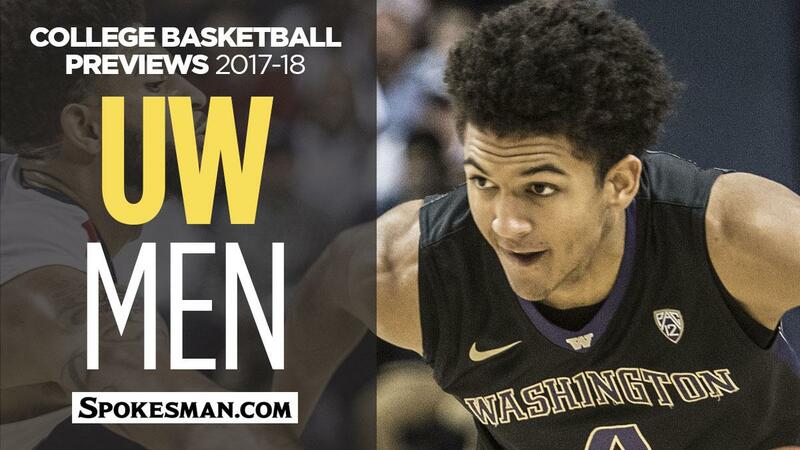 Listen to Hopkins’ first 2017-18 news conference as he recounts the story of freshman Jaylen Nowell, the former Garfield High standout, recommitting to UW after the coaching change. Here’s Hopkins, mild-mannered one minute and then pounding the table and screaming, “Yes! Go Dawgs! Let’s go, baby!” while reliving one of the first recruiting wins during his short tenure at UW. It’s a good memory, but admittedly the transition hasn’t always been smooth. Markelle Fultz bolted to the NBA and Michael Porter Jr., the nation’s No. 1 prospect, bailed as part of a mass exodus from Montlake. With the exception of Nowell, Hopkins lost every 2017 recruit who originally committed to UW. He inherited the remnants of last season’s 9-22 team that finished 11th in the Pac-12, while adding a handful of newcomers. “It’s not exactly smooth, but it’s been pretty darn smooth because we have a great staff,” Hopkins said. Hopkins hired Will Conroy, the former UW standout and lone holdover from Lorenzo Romar’s staff, and put him in charge of the guards. Former Seattle University coach Cameron Dollar instructs the post players, and former Nevada coach Dave Rice oversees the forwards. UW’s top priority is overhauling a broken defense that finished 306th nationally in field-goal defense, 344th in 3-point field-goal defense and allowed 81.1 points per game last season. Since the start of fall practice Sept. 29, the Huskies began implementing a 2-3 zone that Hopkins brought with him from Syracuse. “I’ve been doing it for a long time, so it’s been in the DNA,” he said. “If you cut me, the zone would come out in my blood. The Huskies return three starters and four of their top five scorers, including David Crisp (13.8 points per game), Dickerson (12.5), Thybulle (10.5) and Carlos Johnson (5.9). “The guys who can help us win in our system are playing,” said Hopkins, who declined to announce a starting five. “Every game that we play, that’s the entire goal. Washington begins play tonight – an exhibition against Saint Martin’s – and opens the regular season Nov. 10 versus Belmont. “There will be growing pains, but the one thing and the message that I want to get out to everybody is grow with us,” Hopkins said. “You got to grow with us. This is a plan. A system. A newness. The biggest pick-up in Washington’s recruiting class? Noah Dickerson. Sure, the 6-foot-8 junior was the Huskies’ leading rebounder and No. 3 scorer of a year ago. But in the Uber-hailing chaos following former coach Lorenzo Romar’s dismissal, Dickerson’s decision to pull back on his pondered transfer to either LSU or Florida felt like a recruiting win for new coach Mike Hopkins. In fact, with all but Jaylen Nowell from Romar’s heralded recruiting class beating feet elsewhere, Dickerson’s return gives the Huskies roster at least a smidgen of credibility. In an otherwise lost 2017 season, Dickerson made notable jumps in scoring (12.5 from 7.5) and rebounding (8.2 from 5.2), but was mostly more efficient – his shooting percentage rising from 46.7 to 54.7. Minutes were up; turnovers were down. And Hopkins senses more with Dickerson slimmed down this season. There will be lots of 509 in the 206 this college basketball season. For the first time in 38 years, the Washington Huskies will play each of state’s other NCAA Division I basketball programs in the same season – which means trips to Alaska Airlines Arena for all four of schools, in addition to UW’s annual visit to Washington State in Pullman on Jan. 6. Eastern Washington gets the first in-state crack at the Dawgs on the season’s first weekend, Nov. 12. Twelve days later, former EWU coach Jim Hayford – in his first year at Seattle University – takes his Redhawks across town. UW’s big nonconference home showdown is a Sunday afternoon date with Gonzaga on Dec. 10. Washington State visits Seattle for its return match on Jan. 28, another Sunday game. During the 1979-80 season, the Dawgs met both Gonzaga and Seattle in addition to the Cougars before EWU had made the jump to Division I. Other highlights of the UW nonconference schedule include an appearance in the 2K Classic in New York City where the Huskies open with Providence, and a Dec. 6 meeting with Kansas in Kansas City, Missouri. The Huskies open Pac-12 play with a Dec. 29-31 road swing to USC and UCLA – which don’t have to make the Northwest trek this year. Arizona visits the Huskies on Feb. 3.